Country of Origin Liberia and Ivory Coast. Additional Information: This beautiful figure comes from the Dan people of north east Liberia or Ivory Coast. It depicts a standing pregnant figure with open hands, strong breasts and prominent belly. The Dan numbering about 350,000, live as farmers in small villages and towns in Northwest Liberia and eastern Ivory Coast. Sculpted female figures among the Dan or Yacuba are commissioned by wealthy or socially prominent men to represent their favored wife. Sometimes sculpted with a baby on their back the figures exemplify the ideas of fertility and continuity of the family. 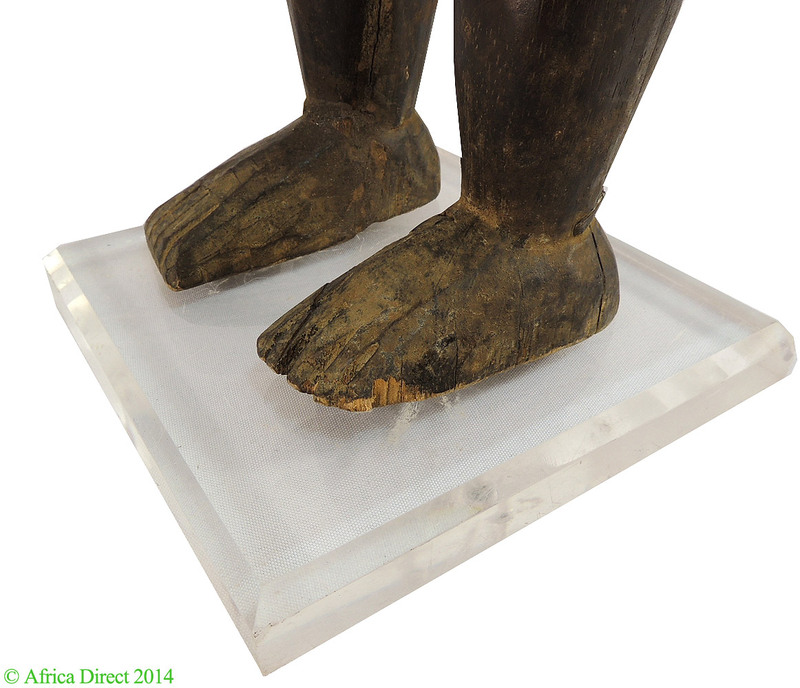 These figures are known as ‘lu me’ or wooden person and can be over 60 centimeters in height. They do not portray ancestors but are stylized portraits of real individuals closely representing the hairstyle, body markings, and physiognomy of the wife. These sculptures are superb examples of Dan sculpture and were often the work of well-known artists who worked in secret away from women and children as they carved the lu me figures. In some instances ‘lu me’ sculptures are made public to the village during a ceremony in which the man who commissioned the carving is recognized and gaining social prestige. These figures may also be kept in small houses and only publicly shown on special occasions.